We are here 6 days a week, every week. Competitive Recreational Products Financing to Help You Sell More! Lifestyles Financial Services Ltd. offers some of the best recreational financing products in the industry. Competitive rates and flexible plans enhance the purchasing power of your customers, allowing you to significantly increase your sales and income. Over the past 14 years, our Alberta-based company has established a strong reputation for getting the best financing. We want to help you help your customers in living their dreams. Our loan specialists work hard on your behalf, offering attractive alternative solutions to your regular sources of financing, as well as the manufacturer’s finance programs to help you sell more. Lifestyles Financial follows a hands-on approach for close, direct interaction with your customers and their lenders. We eliminate the stress and confusion of obtaining financing by researching your customers’ best options and guiding them through the paperwork. In simplifying the loan process (there is no need for a bank appointment) we help you close more deals and sooner than you thought. Our recreational financing specialists are there for you whenever you need. Personalized attention has made us the first choice of dealers and their customers across the country. We understand that every deal is important and offer fast turnaround for a great customer experience. Royal Bank of Canada (RBC), BMO Bank of Montreal, Scotia Bank, Finance It and many Credit Unions compete for our business. Our business has been built on integrity while delivering superior service to our power sports dealers and their customers. We specialize in recreational products financing assuring you of the best possible rates and service. 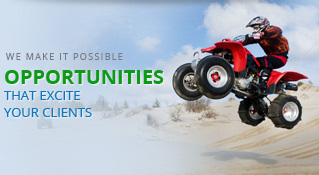 Our straight-forward business ethics have made us a leader in the power sports finance industry. Call 1-866-967-4760, email us at credit@lfservices.ca or sign up your dealership online for power sport financing options to enhance your sales. It’s easy, it’s profitable and it works.